I was not happy with the track arrangement around the Kopper furniture factory. Particularly the track to Gregorius Wood looked awful. You can see a good shot of the area in an earlier post. Since this is a trailing point siding, I need substantial amount of track to pull cars. Ideally enough track to pull all cars from the siding with one movement. The curve right after the turnout is sub-optimal. I can't go straight out of the turnout, since I'd run off the baseboard, or get really close to the edge. 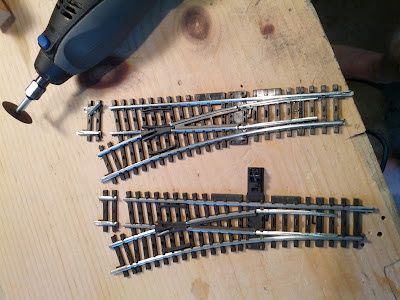 The solution involved shortening the stock Maerklin turnouts using a Dremel with a cut-off disk. This had two nice effects. It moved the divering legs of the turnouts closer together, and I gained just enough space to now run the Gregorius siding straight out of the turnout. By reducing the length of the turnouts, I gained just enough space between the switch and the end of track to fit the length of the siding, plus a Koef switching locomotive. 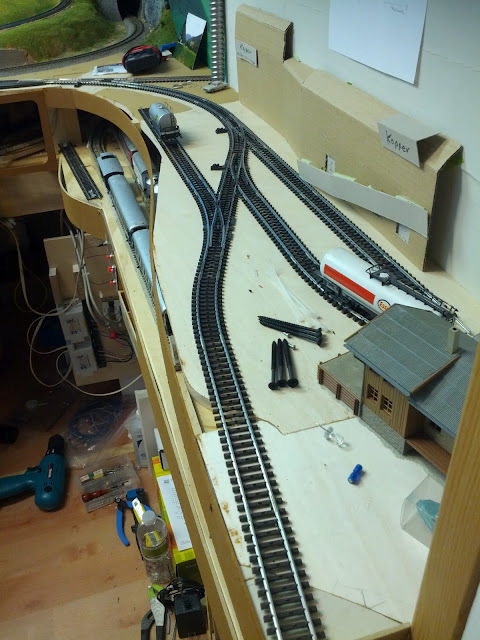 The overview shot below nicely shows the positive effect this small change had on the track layout in the area. 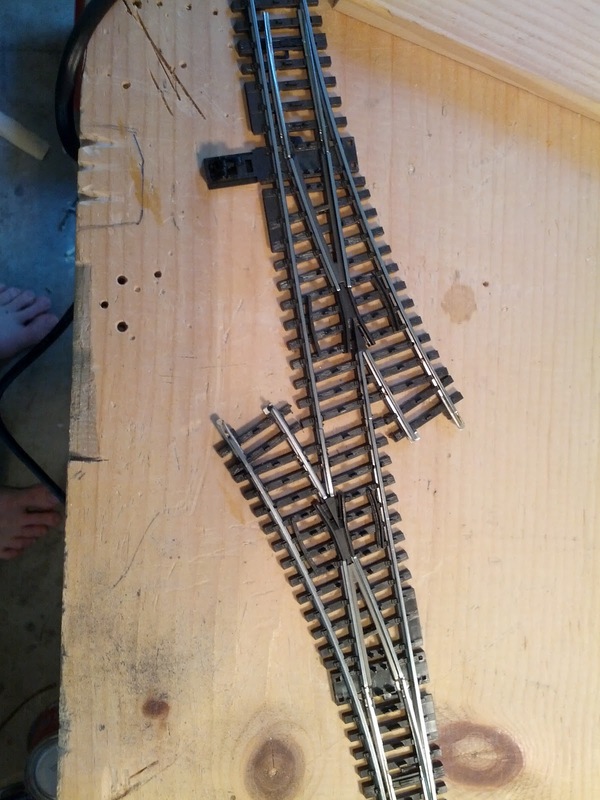 You can also see the smal triangular piece of plywood I added at the very end of the pull-out track to gain a whee bit more track length all the way to the edge of the layout entryway. The only catch is that I had to cut some of the electrical connections in the turnouts for this to work, and the joint is very fragile. I'll need to wire the siding and pullout track separately, but that was planned anyways, so nothing lost here. The pullout track will double as team track during operating sessions. Hallo, was ist in Dich gefahren? Jede Menge Job-Aktivität und so ein bißchen Familie hindert dich doch immer wieder am Hobby weiterzuarbeiten; und nun dieser gewaltige Schub mit Hintergrund und Erklärung warum was wie aussieht und wie man vorankommt und ich dachte schon, die Drehscheibe wird Dich ne Weile beschäftigen! PHHH mitnichten. Ich glaub es nicht, daß man immer wieder von Machen und Machen so frisch einsteigt und mit solcher Freude die Schritte macht. Chapeau, wie wir durch neue internationale Kontakte gerne sagen! Neee, neee, es ist schon einiges passiert, aber ich hatte keine Zeit und Musse darueber zu schreiben. Das wird jetzt nachgeholt.